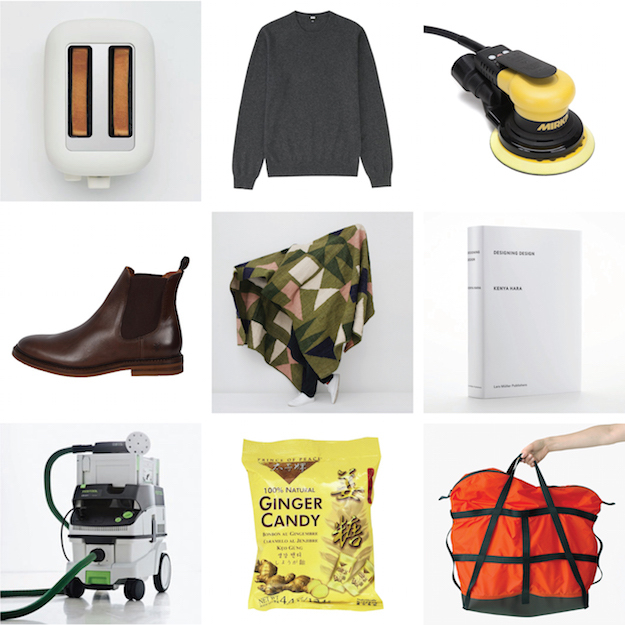 We've put together our annual holiday wish list just in time! Above and below are wishes from everyone in the studio. For more info on these and even more items, check out our Pinterest. We'll be keeping our fingers crossed! 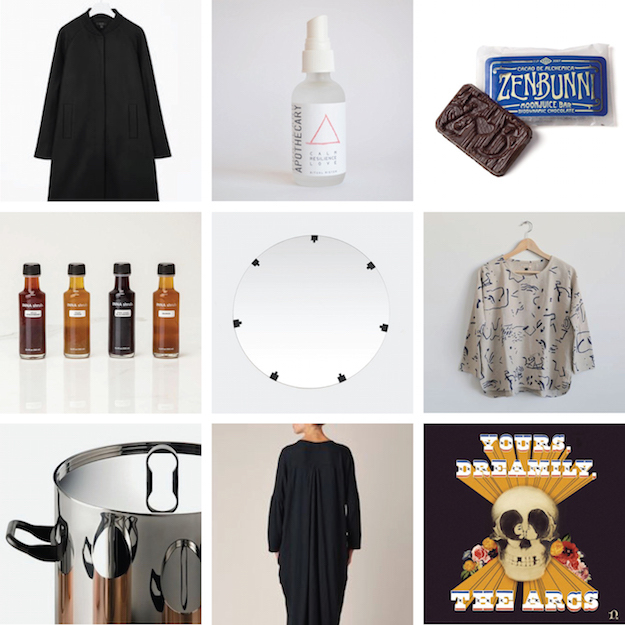 Chelsea's wishes (from left to right): Cos Rib-neck Wool Coat $275.00, Portland Apothecary Ritual Mister Set $36.00, Zanbunni Moon Juice Bar $3.00, INNA Shrub Gift Set $30.00, Grain Stitch Round Mirror $1,185.00, See Sun Matter Top $140.00, Alessi La Cintura di Orione Stockpot $275.00, Black Crane Cocoon Dress $156.00 and The Arcs Yours, Dreamily $11.00. James' wishes (from left to right): Skagen Ancher Leather Watch $175.00, Fred Beckey's 100 Favorite North American Climbs $79.95, Slayer Espresso Single Group, Maiden Noir Fleece Ball Cap $70.00, Grain Plank Tray Natural $185.00, Chelsea Heffner's Persimmons Winter Table Print $150.00, Lie-Nielsen Toolworks No. 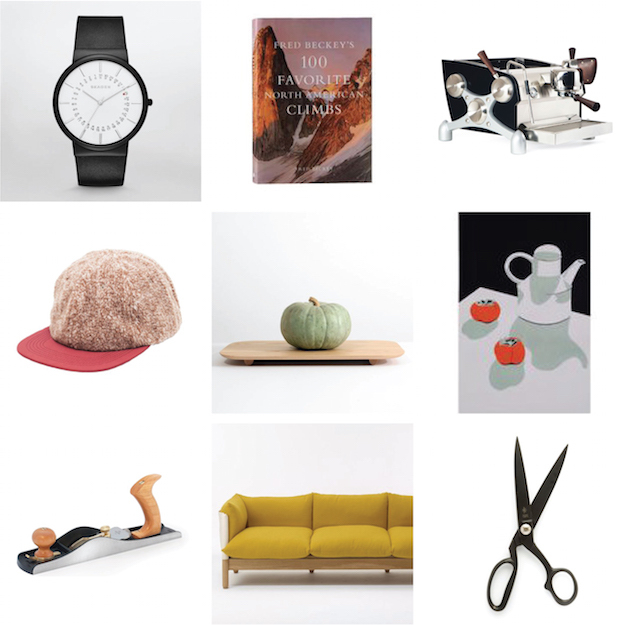 62 Low Angle Jack Plane $245.00, SCP Teepee Sofa by Lucy Kurrein $5368.00, and Best Made Co. Sheffield Shears $76.00. 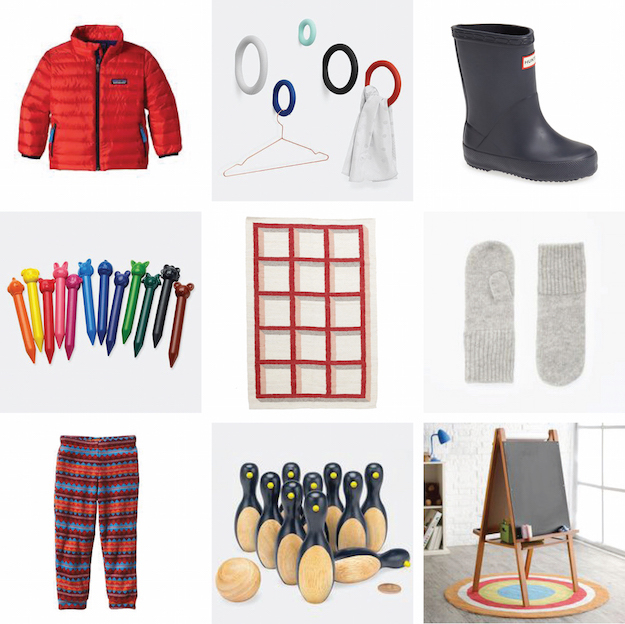 Ada's wishes (from left to right): Patagonia $99.00, Hay Gym Coat Hooks from $18.00, Hunter First Classic Rain Boots $55.00, MoMA Store Animal Crayons $12.00, Grain El Prado Rug Large $850.00, Cos Cashmere Mittens $22.00, Patagonia Baby Micro D Bottoms $35.00, Muji Mini Penguin Bowling Set $25.00, Hayneedle Classic Playtime Junior Easel $74.98. Robyn's wishes (from left to right): Muji Naoto Fukasawa Pop-up Toaster $95.00, Uniqlo Men Cashmere Crew Neck Sweater $49.90, Woodcraft Deros 5" DC Compact RO Sander $595.00, Frye William Chelsea Boots $328.00, Grain Zacapa Rug Large $850.00, Designing Design by Kenya Hara $39.41, Festool 583492 CT HEPA Dust Extractor $650.00, Prince of Peace Ginger Candy $4.49, and Maharam Frame Bag by Konstantin Grcic $295.00.